This is an easy to make, wholesome one pot meal from Gujarat, which doesn't need any side dish. In Rajasthan, gattas are also added to this. However, it can be served with pickle, curd or any chutney. Pressure cook rice and dhal without adding salt. Mash well. In a pan, heat a spoon of ghee and fry cashews till golden brown. Keep aside. In the same pan, heat oil, add cinnamon, cloves and pepper. When pepper splutters, add cumin seeds, curry leaves, grated ginger, chopped green chillies and hing. Saute for 10 seconds and add the chopped vegetables, little salt, turmeric powder and saute well till done. Add these over the rice. Add some more salt for rice and mix well. Garnish with cashews. Melt ghee and top the khichdi while serving. Serve hot with any chutney of your choice or pickle or fresh curd. Kichdi is my all time favorite !!!! wow that is so colorful, healthy and so yummy!! bookmarking it!! 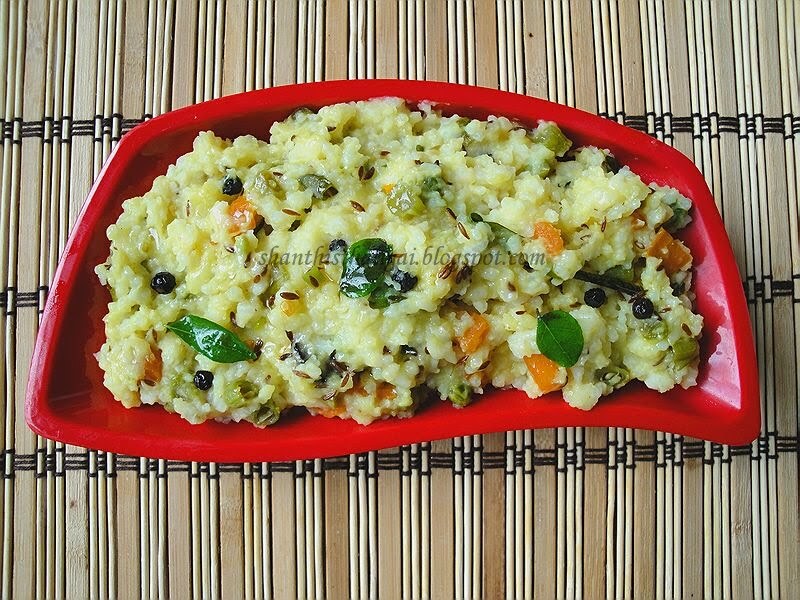 delicious and flavourful awesome and tempting khichdi. Wat a nutritious food,healthy and super comforting. The kichidi looks tasty. And a nice texture too. Wow that looks really tempting aunty. hi shanti, how are you doing..
loking forward for more delicious new year recipes from you. I make this at home regularly - my first gujarathi nanny used to make this for us and I learned it from her. One of our comfort meals.